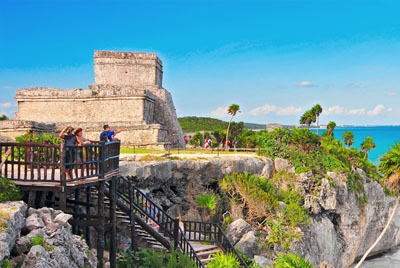 Come an join us on a journey through Mexico traditions in the outstanding Xcaret Park, enjoy the unique experience of swimming with dolphins in a natural environment. If you plan to visit Xcaret Park which is one of the biggest attractions in the Riviera Maya, it is a great idea to include the unforgettable experience of swimming with the dolphins inside the park facilities. This tour offers these two activities at excellent price. Xcaret is a fantastic journey through Mexico traditions and natural beauty with many activities like Underground Rivers, Natural Pools, Beach, Paradise River, Coral Reef Aquarium, Marine Turtles, Manatee Lagoon, Bat Cave, Butterfly Pavilion, Aviary, Scenic Tower among many others, this tour also includes the world famous Xcaret Spectacular Night Show. Come and enjoy an unforgettable experience that includes the access to the park, exquisite food an Interax dolphin swim program. Buffet lunch including one beer and unlimited beverages (soft drinks, flavored waters and coffee) while consuming food. Sea Trek, Snuba, Snorkeling Tour, Shark Interactive Adventure, Stingray encounter, Temascal, Wine Cellar Tour: Wine Tasting of Mexican Wines, Xpa, Tlachco Dinner, towels or photos. Adults rate applies over the age of 11. Children rate applies between 5 and 11 years old who measure less than 1.40 mts. (5.4 feet). Children under the age of 5 who will be swimming with dolphins must pay the dolphin swim fee and must measure at least 1 meter. In Xcaret it is allowed to take photographs, but in Delphinus, for security reasons and to avoid distractions to dolphins, visitors and Animal Care Specialists, it is reported that cameras or video cameras are not allowed in humid areas, as well as companions to the dock areas of the dolphinarium. We appreciate your understanding. Do not forget to bring a credit card or cash to buy souvenirs and photographs. Your belongings and valuables can be stored in lockers (included in the price). This tour is offered as a package and can not be used in parts or on different days, the companions must pay the full tour.